A few years back our camp had a couple of first-timers who arrived in a beautiful Class A RV with a “toy box” attached. About three days into the burn, they packed up and left, telling us that no one had been welcoming or friendly toward them. But the reality is that they secluded themselves in their RV most of the day, and rarely reached out to meet people. Perhaps this tidy pair of Midwesterners was put off by the diverse, rag-tag bunch that is the Burning Man population. Maybe they just suffered from shyness. But the point is, you have to stretch yourself if you really want to benefit from the kinds of relationships that can be formed at Burning Man. 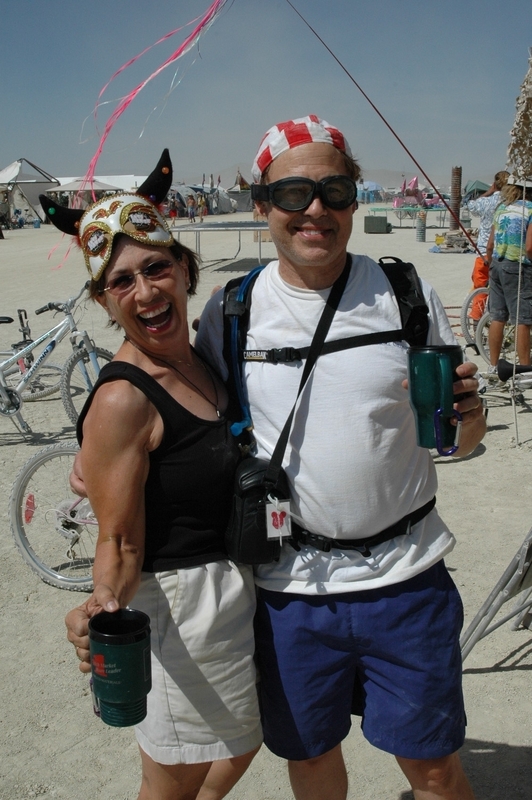 As an older couple, my wife and I could easily segregate ourselves from the large numbers of much younger people who populate the playa. But we choose otherwise. One of the reasons we love Burning Man is because it makes us feel young, and part of feeling young is making friends with young people in our camp and throughout Burning Man. In the default world, I tend to be a quiet individual most of the time, and I don’t often initiate conversations with strangers. But I am different at Burning Man. I love to start conversations or join in on conversations that sound interesting to me. As a couple we constantly seek out other individuals and couples who don’t resemble us in one way or another. They’re either from other countries, from other lifestyles, or just different because of their dress or bodily decorations (everything from piercings to tats). Stretching ourselves to meet people who seem different enriches our experience at Burning Man and our lives as a whole. We drop our pretentions and prejudices in favor of an assertive effort to embrace as many people as possible and be open to all comers. We are constantly surprised by the revelations we receive from people we meet at Burning Man, and are changed by our experiences. This attitude has trickled into our daily lives off the playa and made us open and welcoming to people of all ages, backgrounds and persuasions. We have gained something beyond empathy for all people – we now have an excitement about meeting people who, specifically, don’t look and act like us. We are eager to break out of our shells and touch more aspects of the world. And we are far less judgmental than we used to be – far more open to seeing inner behavior vs. outer appearance. Over the years, we have naturally moved toward more outrageous dress and actions ourselves. While we’ll never be tats and piercing people, we enjoy expressing ourselves creatively through costumes, dress and participation in fun events that mark Burning Man. Our volunteering is part of this process of doing new things and meeting new people. We have been lucky enough to meet some wonderful people with whom we stay in contact in addition to our Lamplighter friends who we stay in touch with via Facebook and occasional activities outside of Burning Man. So my advice to new Burners is simple: don’t seclude yourself away in an RV or even within your own shell. Reach out. People will respond and your experiences will be all the richer.